Basic tracks recorded at Blank Tapes, NY. Final overdubbing and mixing at Compass Point Studios and Sigma Sound, NY. Originally Mastered at Sterling Sound, NY. Limited edition of 50,000. Clear vinyl. 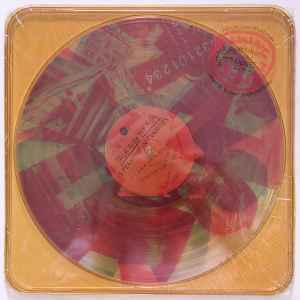 The packaging, designed by Robert Rauschenberg, is a transparent plastic case with artwork and credits printed on 3 12" circular transparent collages, one per primary color. The full-color source material at the bottom of the images page came from a blog post by David Byrne about the project that can be found here. I can vouch for the yellowing of the outer case for this. I have had mine for years and it has definitely gotten more yellow over time. The record still sounds great though. The plastics most commonly used to make the structural cases for electronic equipment are polypropylene, impact styrene, and ABS," replied Deanin. "These all tend to discolor and embrittle gradually when exposed to UV and/or heat. They become oxidized and develop conjugated unsaturation, which produces color. They crosslink or degrade, which causes brittleness." From looking at a stamp on the Super Nintendo's plastic case, I learned that the case is composed of ABS, which is a rugged, durable plastic that is sadly more susceptible to discoloration and degradation from both UV and heat than the alternatives. "There are other plastics which would be more stable," Deanin continued, "but manufacturers avoid them because they are more expensive and/or more difficult to process." Instead of using more expensive plastics, manufactures put additives known as stabilizers, absorbers, or blockers into the plastic mixture to reduce the effects of degradation. They also get creative with their use of pigmentation. "Since most discoloration is toward yellowing, some manufacturers add a little blue to neutralize the yellow," Deanin said. "This gives a temporary reprieve, but eventually the yellow keeps growing and overpowers it anyway." I believe there are 2 versions of this ltd edition: 1 with a clear plastic case, and 1 with a case that is gold-tinted, like the one pictured with the listing.